Governor Len Small, in a signed decree, denied any additional stays of execution for Wanderer. The Illinois governor then decried the fact that his office was the last option for clemency for a death sentence. Capital punishment in and of itself was unjust the governor stated. Assistant Jailer Morris Lochner had the duty of breaking the bad news to Wanderer. Calling Carl over to his bars for a chat, Wanderer waved him off as he paced back and forth in his small cell. “Well?” after seeing that the jailer was not going to leave and had a dour expression upon his face. Carl grabbed a worn magazine and pulled from beneath his bed a newspaper clipping of a picture of him and his dead wife. Staring at it he slowly, carefully folded it and placed it in his jacket pocket. He had dressed for the occasion with all new clothes brought to him by his family. His silk shirt with a starched collar poked out beneath the gray suit. His new tan oxfords looked out of place on the worn, dirty floor of his cell. Having handed off Wanderer to the jailers on the 2nd floor at the death cell, jailer Lochner went about ensuring the scaffold was ready for the next mornings’ job. After filling large burlap bags with sand to simulate Carl’s estimated weight, he dropped them through the trap several times to test the scaffold and the rope. They worked without fault. It was said that the news of Governor Small denying the last clemency bid hit Carl’s father the hardest. The widowed butcher was now going to lose his only son. He was said to be inconsolable. Meanwhile Carl was having his last meal. “Did you see what I did to my dinner? Say, I got away with the largest meal I’ve had in a long time. Cleaned up the plate!” Carl had dined on a chicken dinner sent over from the restaurant across the alley from the jail. Joe Stein, owner of the Noose coffee shop, provided the meal free of charge, asking only for a signed photo from the condemned man. After his meal he settled into a game of cards with his jailers Fred Stedman and Alex Frodin and reporters Charles MacArthur and Ben Hecht. Hecht pushed Carl to allow him to publish a purported confession that Wanderer had given him. Carl’s reluctance was due to not wanting his father to know he was guilty; at least knowing him guilty while Wanderer was still alive and would still have to face his father. It was said Carl displayed a gaiety not often seen in condemned men. He sang songs, swore mightily when the cards turned against him, and appeared without a care in the world. Hecht kept pushing him to confess to the real motive. Ben Hecht’s Chicago Daily News story published September 30th, 1920 and headlined CONFESSES TO THE DAILY NEWS purports to give a firsthand account of the condemned man’s last night. It has been lightly edited for flow. The September 30, 1921 Chicago Daily News article written by Ben Hecht. His voice had lost some of its clearness. He began to pray passionately and sing, ‘Oh, into your hands I give my spirit’ and repeating the Lutheran ritual after the minister. When he had finished an hour of prayer… the death march started, Wanderer handcuffed now, walked quickly from the second-floor cell to the deathroom. He began to sing. The march started at 7:14. 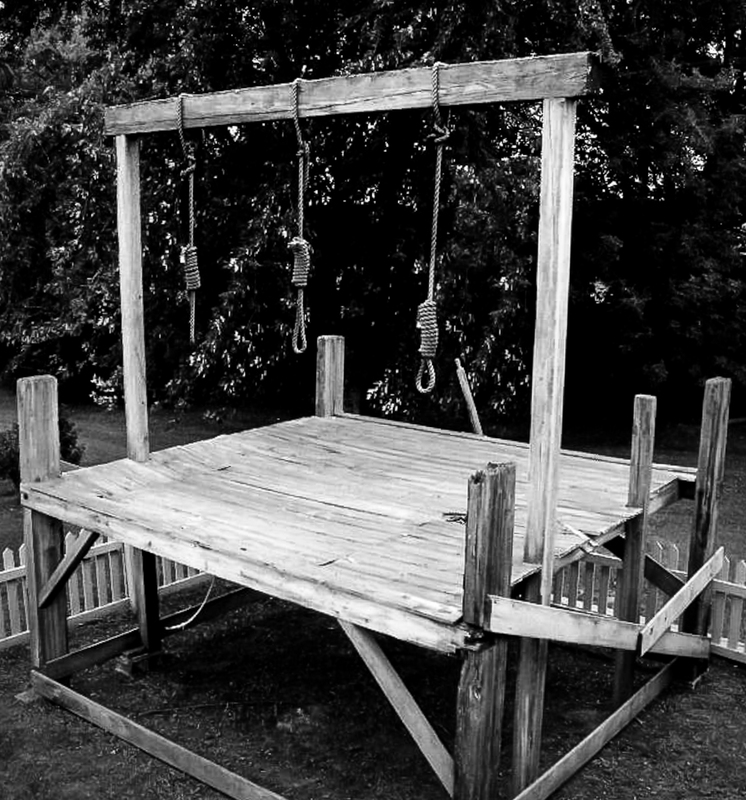 The original gallows from the Cook County jail that Carl Wanderer was hanged upon. 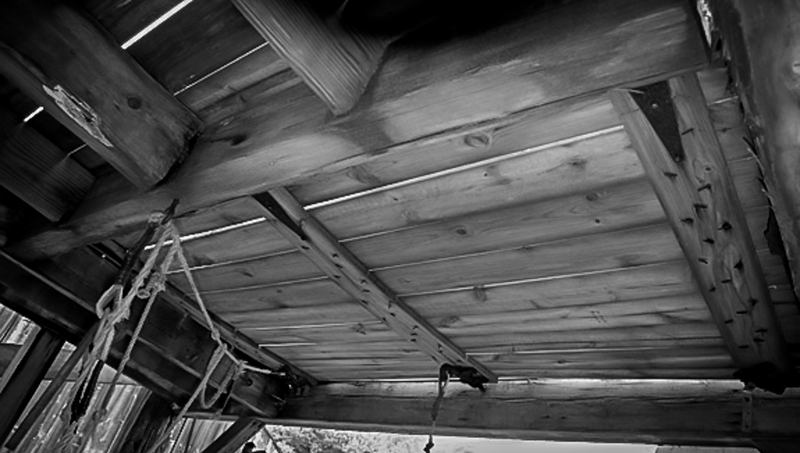 The gallows are currently owned by Ripley's Believe It or Not. Old Pal, why don’t you answer me? Sheriff Lawrence slipped the noose over Carl’s head and positioned the rope to the left side of Wanderer’s neck in the hope that the noose would break his neck giving him a painless death. Carl paused as the noose was tightened snug. A white hood was placed over Wanderer’s head muffling his singing. Hoodwinked, Carl was alone with his thoughts for his last few seconds. The singing stopped and whispered prayers started. Ninety-Seven years ago today, at 7:19 the morning of September 30th, 1921, the trap was sprung and Carl Wanderer was hanged until dead. The trap mechanism beneath the gallows of the old Cook County jail. And so, our story ends. Right? … well not exactly. If you’ve been paying attention, you know anything Carl Wanderer related is never as simple as it appears. With Wanderer hanged in the morning coupled with the fact that Chicago Daily News was an afternoon paper, it allowed Hecht to be one of the first to write of it. His column that day declared that Wanderer made a full confession to Hecht that the thought of being a father was repugnant to him. This one column is the first time Hecht hinted at Wanderer being a homosexual. Contrary to Hecht’s claim of a confession, the following day’s Chicago Daily Tribune carried the headline- WANDERER DIES SCORNING PLEA FOR CONFESSION. The October 1, 1921 Chicago Daily Tribune article contradicting the previous day's Chicago Daily News. Conveniently for Hecht, Wanderer was not going to be around to refute the statements attributed to him. How’s that axiom go… dead men tell no tales…. ?